Acrylic products processing acrylic adhesive is a very critical process steps, how to show the characteristics of crystal clear acrylic, acrylic tobacco reflect perceived value packaging products, and to maximize the grade of acrylic products taste, bonding technology has played a pivotal role. 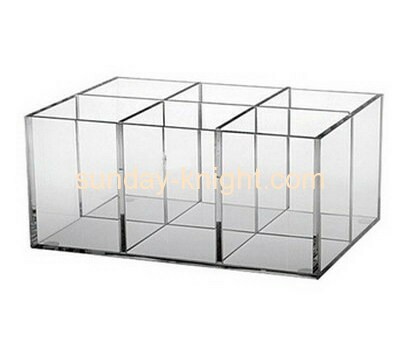 Adhesive acrylic box is mainly affected by two aspects, one is the applicability of the adhesive itself; second bonding techniques. There are a lot of domestic and overseas markets adhesives. There are two types, one is a two-component, such as all-purpose adhesive, epoxy resins; there is a single component, such as CHCl3 ( chloroform ). In general, two-component adhesive curing reaction is achieved by bonding, one-component adhesive is a solvent volatilization final bonding is achieved. Features two-component adhesive bonding effect is good, no bubbles after bonding, not white, strength. The disadvantage is complicated to operate, difficult to cure a long time, slow, difficult to adapt to the requirements of mass production. The general characteristics of the one-component adhesive is speed, can meet volume production process requirements , the disadvantage is after bonding products easy to produce bubbles, easy white, poor weather, which directly affect the outer acrylic products in appearance and product quality,Thus, in the processing of acrylic box, how to choose a suitable adhesive, improve the quality and grade of acrylic products, is a major problem in the bonding process must first be resolved. Both adhesives are their advantages exist shortcomings, can not produce the desired bonding. Later contacted some experts acrylic adhesive developed Western countries, the exchange of experiences and bonding them and found that they also have many types of adhesive applications , but use the time to teach people know what to do , and the price is expensive , the effect is not very ideal . In the processing of acrylic box, how good bonding effect, but also easy to operate, this problem has plagued our work, is a headache and a big problem that must be addressed. Taiwan BONLE chemical bonding of their own research team determined the problem acrylic sheet. Through a lot of acrylic adhesion test, analyze the advantages and disadvantages of existing acrylic adhesive on the market, especially with the exchange of foreign experts, learned a lot of practical knowledge in the people I have, I have excellent ideas under the guidance of a new BL-3094 UV adhesive curing UV glue finally born. The product is designed for acrylic, plexiglass, PMMA and other plastic bonding material and design, with moderate viscosity, adhesive power, easy to operate, fast curing, after curing, excess glue sticky dust, sticky, good flexibility, transparent, non-white, non-yellowing, no fog, no bubbles, good weather resistance and other characteristics, so as to solve the adhesive acrylic box when needed fast operating speed, strength, no bubbles, good transparency and other issues I wish you to achieve the desired bonding effect.